You can get now TV Globo Internacional with digital image and digital sound. If you have a DSL or cable internet at home you can easilly get TV Globo without installing a dish. 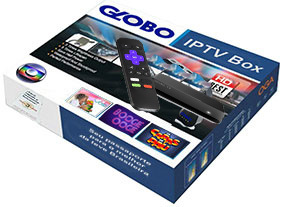 All you need is an IPTV receiver box and subscription (€14.50 / month). The Soap operas. The News. The Humor. The Sport. The Shows. The well-known personalities. The Television that you learned to love in Brazil is now at the distance of your fingertips. If you wish to receive a documentation about TV Globo internacional and the cost of the equipment, channel list of additional brazilian channels with this box click here now. Soon you could become part of an audience that already includes more than 130 countries. For this receiver to work correctly you must have at least 3 MB/sec in download speed. If you are not shure we can help you mesure it before purchase of the receiver. contact us for a speed test. TV Globo na Europa. Como receber o canal da Globo internacional na Europa. What Do I need To Watch TV Globo? 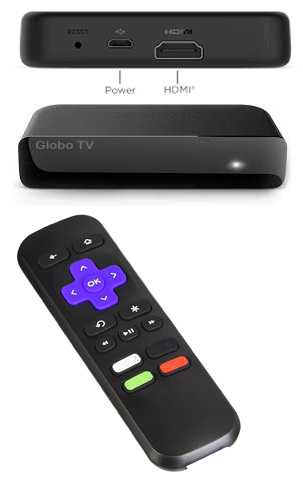 To watch TV Globo Internacional you will need the TV Globo HD receiver box. It is connected on one side to your home DSL or Cable internet rooter either via an Ethernet cable or wirelessly via Wifi to get the signal and also to your TV screen via a standard HDMI cable. You have of course a remote handset to change the channels. This box is used in the same way as any cable TV box. The subscription is open once you install the box so you won't loose subscription time while the box is travelling to you. comes with detailed step-by-step instructions on how to connect and how to subscribe. Info on payment options. Read this only if you meet difficulty. All other countries please enquire. Brasil. A gente vê por aqui. TV Globo dedicated Broadband HD receiver. Requires a supscription of EUR 14,50 per month. Comes with detailed step-by-step instructions on how to connect and how to activate subscription. Info on payment options; Read this only if you meet difficulty. 48 H delivery in the EC.